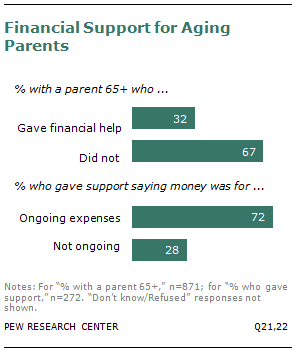 Americans believe overwhelmingly that adult children are obligated to provide financial assistance to an aging parent if needed: 75% say this is a responsibility, 23% say it is not. This sentiment is shared across most major demographic groups: men and women; whites, blacks and Hispanics; college graduates and those with only a high school education. Adults under age 40 are somewhat more likely than middle-aged and older adults to view this as a responsibility. Fully 81% of those ages 18 to 39 say adult children have a responsibility to provide financial support their elderly parents; 75% of adults ages 40 to 59 agree with this, as do 68% of those ages 60 and older. This sentiment cuts across partisan and ideological lines, with about three-quarters of Republicans, Democrats, conservatives and liberals agreeing that providing for an aging parent in need is an adult child’s responsibility. Adults who have a parent age 65 or older are no more or less likely to view this as a responsibility than are those who do not have a parent in this age group. Moreover, those who have provided this type of assistance to their own parents express nearly identical views as those who have not done so. The public is less convinced that parents have an obligation to support a grown child who needs financial assistance. 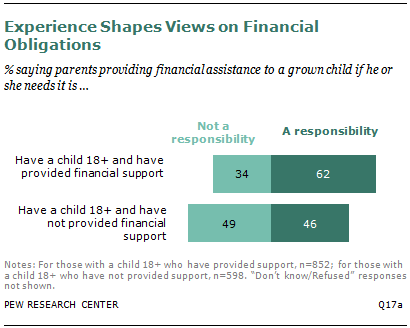 About half of all adults (52%) say providing such assistance to a grown child is a parent’s responsibility. Views on this issue are fairly consistent across major demographic groups. Older adults are somewhat more likely than middle-aged and younger adults to say parents have an obligation to help out a grown child in need. Some 57% of those ages 60 and older consider this a responsibility, compared with 51% of those ages 40 to 59 and 50% of those younger than 40. Adults who have a child age 18 or older are more likely than those who do not have a child in this age group to say parents have a responsibility to support their grown children (56% vs. 49%). And adults who have actually provided financial assistance to their grown children are even more likely to view this as a responsibility. Among those who have provided any support to their grown children in the past 12 months, 62% say parents have a responsibility to provide financial assistance to a grown child if needed. Among those who have a grown child but have not provided financial support in the past year, only 46% agree. About one-third (32%) of all adults with a parent age 65 or older say that they have given a parent financial support in the past 12 months. Of those who have given this type of support, a strong majority (72%) say it went toward ongoing expenses. The share of adults providing this type of support has not changed significantly since the Pew Research Center first measured it in 2005. At that time, 29% of adults with a parent age 65 or older said they had provided financial help to a parent in the past year. Of that group, 41% said they had provided the money on a regular basis, while 53% said the money was given for special circumstances. Middle-aged adults are more likely than younger and older adults to have a living parent age 65 or older, and therefore they are more likely to be providing financial assistance to a parent. Among all adults ages 40 to 59, 21% have a parent age 65 or older and have given financial help to a parent in the past year. This compares with 6% of younger adults and 7% of adults ages 60 and older. Beyond middle-aged adults, other demographic groups stand out in terms of their level of financial support for their aging parents. Among those with at least one parent age 65 or older, Hispanics and blacks are much more likely than whites to be helping out a parent financially. Some 65% of Hispanics and 40% of blacks say they have provided financial support to a parent in the past 12 months. This compares with 24% of whites. There are also sharp differences across income groups. Adults with lower annual household incomes are more likely than those with higher incomes to be supporting their aging parents. Among those with at least one parent age 65 or older, 44% with an annual income of less than $50,000 say they provided some financial support to a parent in the past year. By contrast, among those with incomes of $50,000 or higher, only 23% say they did the same. 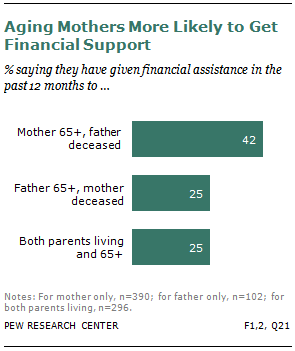 In addition, more financial help is flowing to aging mothers than to fathers. Among respondents whose father has died, fully 42% say they have given financial help to their mother (age 65 or older) in the past year. Among those whose father (65 or older) is living but their mother has passed away, only 25% say they have helped out their father financially. And among those with two living parents (both of whom are age 65 or older) one-in-four say they have provided financial help to a parent in the past year. It turns out that grown children may be more financially needy than aging parents. Among all adults with at least one child age 18 or older, nearly two-thirds (63%) say they have provided at least some financial support to a grown child in the past 12 months. This burden falls most heavily on middle-aged adults. Of all adults ages 40 to 59, nearly half (48%) have provided financial support to a grown child in the past year. Among those middle-aged adults who have a child age 18 or older, fully 73% have provided some assistance to at least one of their grown children. This compares with 49% among those ages 60 and older with at least one grown child. Different types of financial assistance flow to grown children. 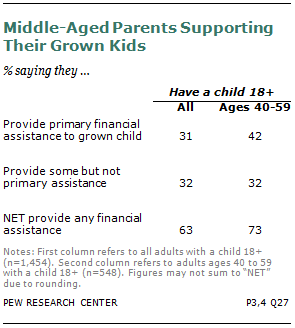 Some parents are the primary source of financial support for their grown children. Others are providing some assistance though not the primary support. Among all adults with at least one child age 18 or older, 31% say they provide the primary financial support to one or all of their grown children. Among adults ages 40 to 59 with a grown child, fully 42% provide primary support. This represents a significant increase from 2005, when 33% of adults ages 40 to 59 with at least one child age 18 or older said they were providing primary financial care to a grown child. Among those parents who are providing primary support to a grown child, roughly half (52%) say they are supporting their child or children because they are enrolled in school. An additional 46% say they are providing this support for some other reason. In 2005, parents were somewhat more likely to say they were providing primary support because their grown child or children were in school (56%), and somewhat fewer said it was for some other reason (39%). Hispanic parents are more likely than black or white parents to say they are providing primary support to a grown child. Among Hispanic adults with at least one grown child, 54% say they are providing primary financial support to a child age 18 or older. This compares with 36% among black parents and 27% among white parents. Low-income parents are somewhat less likely to be providing primary financial support to a grown child, but middle-income and upper-income parents are about equally likely to be doing so. Among those with annual household incomes less than $30,000, some 27% of parents with at least one child age 18 or older say they are providing primary financial support to a grown child. This compares with 34% of those making between $30,000 and $100,000 and 39% of those with incomes in excess of $100,000. Of those parents who are not providing primary support to a grown child, about half (46%) say they have given at least some financial assistance to a grown child in the past 12 months. The profile of these parents who help their grown children occasionally but do not provide primary support is somewhat different from the primary supporters. Parents in the highest income category are much more likely to have provided this type of support. Among parents with annual incomes of $100,000 or higher who are not providing primary financial support, 66% say that they have given some financial assistance in the past year. This compares with 49% of parents with incomes between $30,000 and $100,000 and only 40% of those making less than $30,000 a year. For some adults, the financial burdens and responsibilities go both ways—they are both supporting an aging parent and helping out a grown child. Only about 8% of all adults fall into this category, but among middle-aged adults the share is significantly higher. Some 15% of adults age 40 to 59 are providing financial support to a parent age 65 or older as well as either raising a minor child or supporting a grown child. This compares with 4% of those either younger than 40 or age 60 and older. Across most major demographic groups, fewer than one-in-ten adults fall into this category (providing financial support to both an aging parent and a child). There is, however, one important exception. Hispanic adults are more than twice as likely as blacks or whites to be in this situation. Among all Hispanics, 21% say that they have given financial assistance to an aging parent in the past year and that they are either raising a young child or supporting a grown child. This compares with 8% of blacks and 5% of whites. There are no significant differences across income or educational groups in the share providing financial assistance to both parents and children.